He is a former MLA, a khandani landlord and owns more than 121 hectare (ha) apart from many local businesses. Known as the ‘sarkar’ of Sonkachch tehsil of the dry Dewas district of Madhya Pradesh (MP), Rajendhra Singh Baghel met natural farming guru Subhash Palekar about 10 years ago. Today, Baghel campaigns for water conservation, natural farming and promotes local crops in 32 villages in his tehsil. On his own land, he grows traditional crops and a variety of fruits. Another powerful landlord Prem singh Khichi from Tonk Kalan village in Tonk Khurd tehsil set a record of investing in most borewells in the area. 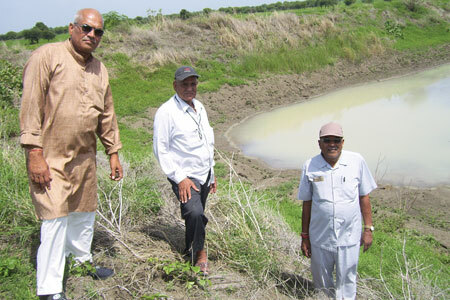 In the last five years, Khichi’s clan has dug 34 ponds on 405 ha. Khichi has inspired villagers to dig 60 more ponds, taking the number to 94. Khichi expanded a small talai– traditional pond for cattle to drink water––on his land into a one ha pond worth Rs five lakhs. Crop production on the land surrounding the pond tripled that year. Within four years, 34 new ponds were built by Khichi with the aid provided by the then collector under Madhya Pradesh’s Reva Sagar and Balaram Talao schemes. (see box). Keen to follow the example of the Khichi family, villagers dug 60 more tanks with subsidies under the same schemes. “I incurred huge loans in sinking four useless tubewells before Bhaisaheb (Khichi) helped with Rs 80,000 for my 0.4 ha and now my production has doubled,” said Kamal Singh Gujar, a farmer. With the help of local administration, neighbouring villages dug more ponds. About 1,200 ponds have been dug in the Tonk Khurd tehsil following Khichi’s example. Water levels in wells have gone up in neighbouring villages located downstream from his land. “We used to get drinking water for cattle from borewells or hand pumps earlier. Our cattle numbers have gone up too,” said Ibrahim Khan, a resident. The Bhils and Banjara tribes living in the same region also use water from Baghel’s tank for irrigation. To boost his land’s water retention capacity, Baghel grows less water intensive local crops like jowar, legumes and oilseeds to break the monopoly of soyabean, the Kharif crop. “Madhya Pradesh has an organic farming policy, but it has remained on paper because bureaucrats and politicians benefiting from the input trade are not keen to implement it,” said Baghel.